Fidel Castro accused U.S. authorities of torturing a convicted Cuban spy, telling a meeting of communist youths that the agent had been placed in solitary confinement in California. At the meeting was former castaway Elian Gonzalez, now 16, who could be seen listening intently to the ex-Cuban president when footage of the closed-door session aired on state-run television Friday night. Castro, who turns 84 on Aug. 13, is suddenly making near daily appearances in and around Havana, after spending four years almost completely out of the public eye following emergency intestinal surgery that forced him to cede power to his younger brother Raul. 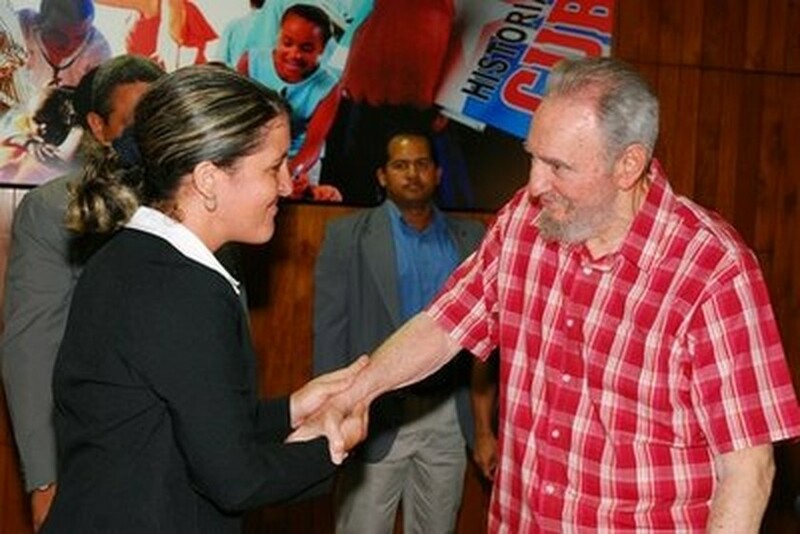 In this photo released by the state media Cubadebate web site, Cuba's former leader Fidel Castro, right, shakes hands with Yailin Orta Rivera, Juventud Rebelde journalist and professor at the Communications College at the University of Havana, during a meeting with youth at the Havana Convention Center in Havana, Cuba, Friday July 30, 2010. He has occasionally turned up in green fatigues similar to the military uniform that had been his trademark during nearly half a century in power. This time, however, Castro wore a red-checkered shirt and gray pants while speaking for a bit more than an hour in Havana's convention center. Looking relaxed and engaged, Castro spoke about the case of Gerardo Hernandez, who is serving a double life sentence on counts of conspiracy to murder four Miami-based pilots who were slain by Cuban jets in 1996 when they were dispersing pro-democracy pamphlets on the island. Hernandez is one of the so-called "Cuban Five" intelligence agents that Cuba says it sent to the U.S. to infiltrate anti-Castro groups linked to 1990s hotel bombings and other terrorists attacks on Cuban soil. The five were convicted in the U.S. of spying. Castro said Hernandez has been placed in solitary confinement at a prison in Victorville, California. "Did he do anything? No, nothing," he said. "Four FBI officials met to decide and they decided. That's torture. There's nothing else to call it, it's torture, and its occurring in view of the whole world." Castro also said Hernandez was in need of medical treatment he was not receiving. A spokeswoman for the U.S. Interests Section in Havana — which Washington maintains instead of an embassy — referred questions about the case to the Federal Bureau of Prisons, which said it was up to authorities at the Victorville facility to comment. Two calls to representatives at the prison went unanswered Friday. Complaints that Hernandez had been placed in solitary confinement have been made throughout the week by Ricardo Alarcon, speaker of the Cuban parliament, which convenes Sunday for one of its two full sessions a year. "It was very emotional to again see the commander. I missed seeing him and it makes me very happy," said Gonzalez, who was the center of a nasty international custody battle a decade ago and was frequently visited by Castro after he returned to Cuba. When asked if he had any advice for Cuban youth, Castro said, "we can't focus on the future with the concepts and images of the past." "Everything is new," he said, "you have to let your imagination soar." But Castro repeated a warning of coming nuclear war, which he has claimed for weeks will pit the U.S. and Israel against Iran, and be worsened by tensions between North and South Korea. "Why do our children and adolescents have to die?" Castro asked.